Take a scenic drive up Big Horn Mountains then hike a little over a mile and a half to breathtaking views! 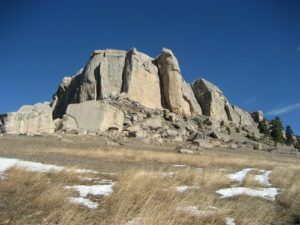 Steamboat’s rock face looks somewhat formidable but a fairly easy trail (Class 1 in the hiking world’s rating system) leads around it to the summit. The round trip hike of Steamboat Point is about 1.7 miles with a 700-foot elevation gain. Allow approximately 1½ hrs. to make the hike up and back, depending on experience. Take Hwy 14 west (towards Dayton), eventually winding your way up the mountain for 12.5 miles. (The Fallen City turnout on left with interpretive signs is worth a stop.) Steamboat Point will be on your right. Look for large parking area on left directly across Hwy 14 from the base of Steamboat Point. 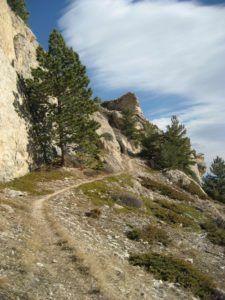 Hike up a faint two track trail which climbs rather steeply towards the base of the rock face. After it becomes a single-track trail, you’ll follow the bottom of the cliffs east. Shortly after you go through a small break in the rocks, the trail forks. Head left where an easy trail travels through sparse forest to the top. Winds are sometimes brisk at the top.